If you watch two dogs meet for the first time, you’ll often see them walk towards each other in a slight arc, curving towards each other, rather than approaching head-on. But have you ever wondered why dogs do this? ‘Curving’ is a cunning strategy dogs use to create space! A curved approach is less intrusive than a direct, head on greeting because it involves a slight change of direction. Subtle but clever eh? And, curving also buys the dogs ‘time’… time to suss out one another! Watch your dog’s nostrils twitching overtime if he nears another dog; both canines will be busily ‘messaging’ each other …in scent! How tense or how relaxed the other dog’s body posture is. The more relaxed the better! Where the dog’s weight is centered. In the picture above the white dog’s clearly has his weight forward, while the black haired dog’s weight is slightly back. This is all part of assessing mood, confidence and friendliness. Weight backwards could indicate the dog is a bit apprehensive, ready to go into ‘flight’ mode.  The dog’s tail position – is it upright, down or mid-way? Is the tail wagging fast, slow … (ideally) or windmill stylie? It gives more time for each dog to read the other’s facial expressions. Just like us, dog’s can raise their eyebrows, frown and tense their facial muscles! The dog’s ear position – are they pricked up, tucked back, positioned forward or hanging down? And what about the eyes? Is the dog giving a hard stare (beware!) or does he have soft, squinty eyes indicating friendliness. Dogs have a whole repertoire of body language signals, curving is just one of them. Curving is a subtle technique but a vital part of good doggie manners! 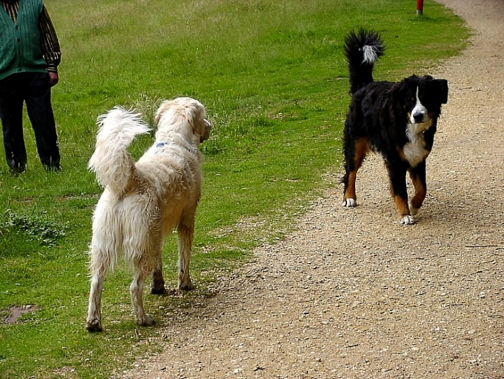 Watch the dogs in your local park – are they courteous canine ‘curvers’?